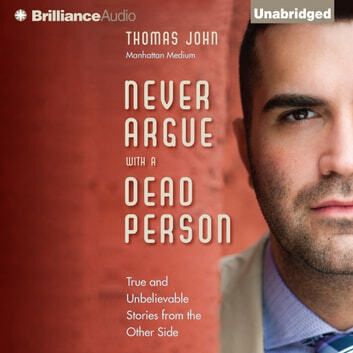 Manhattan Medium Thomas John has been hailed as "the Hollywood psychic with the highest batting average" by The Hollywood Reporter, and a psychic medium with "an impressive connection that impresses even the most skeptical minds" by The Examiner. Now he shares what he's seen and heard on the Other Side. The dead understand what our ultimate purpose is on earth-and they are eager to share their knowledge. Our dead family and friends are with us and watch over us. When we die, we begin again. We continue to grow and evolve on the Other Side. We are accountable for the way in which we live our lives. Karma is real. The dead are capable of tremendous and profound forgiveness.